Never get lost again with Street View on Google Maps. If you find that it's hard to locate where you're trying to get to, then this is a map app you want to have on hand at all times. You can look for streets anywhere in the world as long as the app has a connection. Each street has a photographic landmark that makes it easy to recognize. If you see the landmark when you're on the street, then you know you're in the right place. Some of the pictures with Street View on Google Maps are a bit dated, but for the most part, the pictures that are used are recent. This is an app that makes it easy to find specific attractions in cities where you plan to visit so that you don't wast time asking people or driving around looking for the location. One of the fun features is that you can view the inside of attractions, such as museums and national landmarks, to get an idea of what you can expect when you arrive. New locations are sent to your email or are sent by text message. • Try an easy new way to connect your photos. 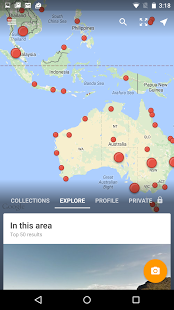 • Use the Contribute tab to find places near you that are missing 360 photos. • See your most popular photos (and more) with our new Stats panel. Map your location, track your location, import your images, and much more!